Located in the heart of the Quartier des spectacles in the place des festivals, the F Bar is the younger sibling of celebrated Portuguese restaurant, Café Ferreira. Its refined cuisine, chic clientele, and simple decor make it the place to be for Montréalers and tourists alike. A great window on local happenings. Before going to see a show at the Outremont theatre, wandering along Rue Bernard and feeling a little hungry, any excuse is good to visit the sunny, flowered terrace at Les Enfants Terribles. Classic, brasserie-style fare served for lunch and dinner in the friendliest of atmospheres will please young and old alike. What’s more, the terrace is a happening place all year long. Drop by in October when their pumpkins are all the rage! Bice never ceases to amaze, as much with their refined Italian cuisine as with their exceptional service. Located along an elegant stretch of Rue Sherbrooke, its grandiose, garden-like terrace is the perfect place for an intimate meal, a get-together with family and friends, or for a special occasion. 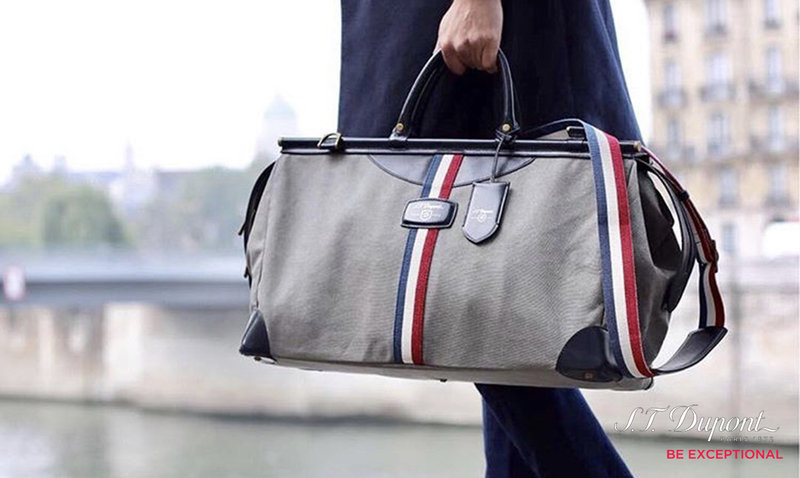 Bice welcomes its guests with warmth and finesse, just like they do at their locations in Milan and Miami Beach. A real must! 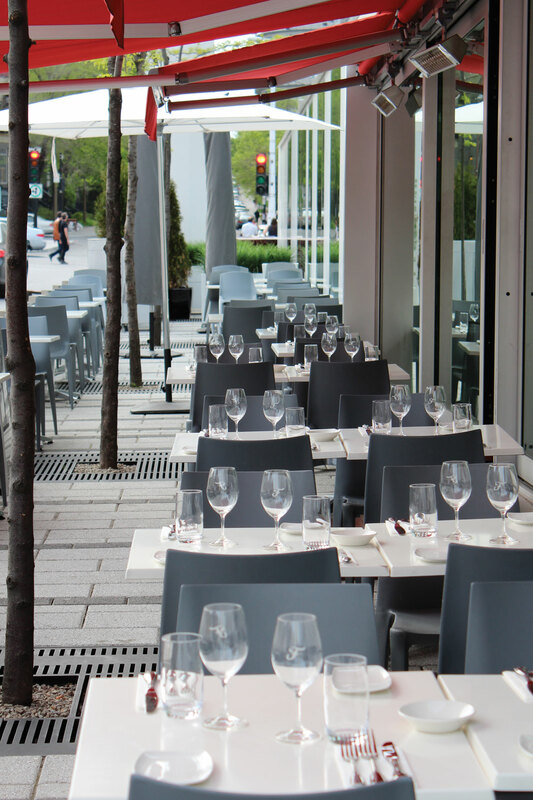 With 120 seats, Le Valois brasserie has one of the biggest terraces in Montréal. Located in HOMA (Hochelaga-Maisonneuve), an up-coming neighbourhood just steps from downtown, Le Valois has received great reviews for its excellent, brasserie-style cuisine and its design by architect Luc Laporte, a restaurant-design specialist. A great place to discover. This is probably one of the top-rated terraces in town. 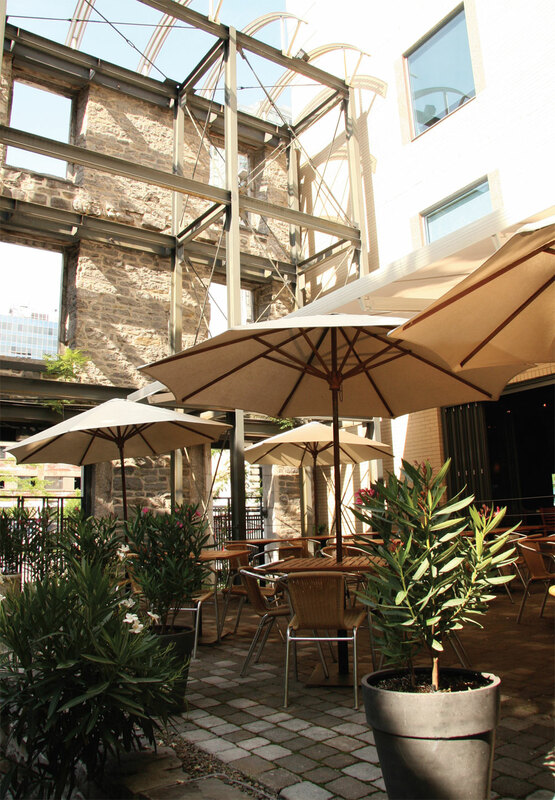 Located in Old Montréal behind the facade of a building with no roof, the umbrellas are always open. Refreshments flow at happy hour; Boris beer of course, pale ale on tap or mixed in a shandy; there is an excellent wine list of private importations; and don’t forget the cocktails – Mojitos, espresso Martinis, Caipiroska, and porto sangria – to name a few. Also on the program: music (jazz and latin), a great menu, amusing illustrations, and best of all it’s open everyday of the summer. Reservations by phone only.